During the Gala of the National Association of Exporters and Importers in Romania (ANEIR), SIVECO Romania has received the Grand Trophy and Diploma of Merit for the export of IT solutions in the field of eLearning, eHealth, and eCustoms to 26 countries. "Since 2008, we have started developing large scale projects on the international markets, and currently 30% of our turnover comes from exporting to 26 countries, where we customized and applied the expertise gained in national large scale projects. We have successful projects in countries of the Gulf region, where we have also opened a subsidiary, in Dubai, where we are exporting eLearning solutions. We have also launched ambitious projects in Central Asia and the Caspian region, in countries from the Community of Independent States (CIS), in countries from North Africa, as well as for the organizations belonging to the European Commission’s structure. Everywhere we are providing innovative technologies, quality products and exporting Romanian know-how. We hope that in the following two years we will reach 50 countries with our solutions", has stated Florian Ciolacu, Vice-president International Sales, SIVECO Romania. 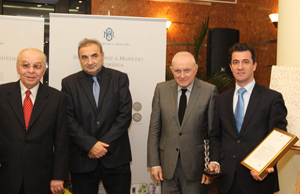 The awards for the most active companies in the field of exports have been granted by Nicolae Văcăroiu – President of the Court of Accounts, Florin Georgescu – Vice-Prime minister, Minister of Public Finances, Mugur Isărescu – Governor of the National Bank of Romania, Adrian Vasilescu – counselor of the NBR’s Governor, and Mihai Ionescu – General Secretary of ANEIR and Co-President of the Export Council of Romania. "2012 has been an extremely difficult year and therefore I want to congratulate you all for having positive results. It is a great achievement. You deserve to the fullest these awards", has declared Nicolae Văcăroiu, President of the Court of Accounts. Within the event were rewarded the companies with positive results in the export of oil products, medicine, glassware, plywood and cement and plaster decorative materials, electric equipment, automotive components, cereals, tobacco, non-ferrous products, as well as the banks that have supported the exporters’ efforts. "You have succeeded in making progress this year, too, which is important. Attracting European funds for increasing the competitiveness, every company’s effort, know-how, and implementing new technologies will contribute to the exports’ growth", has declared Florin Georgescu, Minister of Public Finances. The exports have represented, along with the good trends in agriculture, the main engine of economic growth. „In 2011, Romania has had exports in amount of 45 billion Euros. The most consistent trade exchanges have been with EU member states”, has stated Mihai Ionescu, General Secretary of ANEIR.